I think most of you already know that French people are so tough they eat “pain” for breakfast and let me add its 100% true, they do. Then we might discuss if we decide to speak French or English when we translate the pain. But living in a country with the best bread in the world, talking bread here not cakes, cookies or pastries, why is the “ready to eat” sandwiches often with the “pain Suèdois” logo? First of all Swedish “matbröd” (bread) is far from as good and fresh as the French. A French person looking for a good piece of loaf in Sweden will most likely cry or call for the gendarmerie to catch the villain trying to sell them whatever and call it bread. 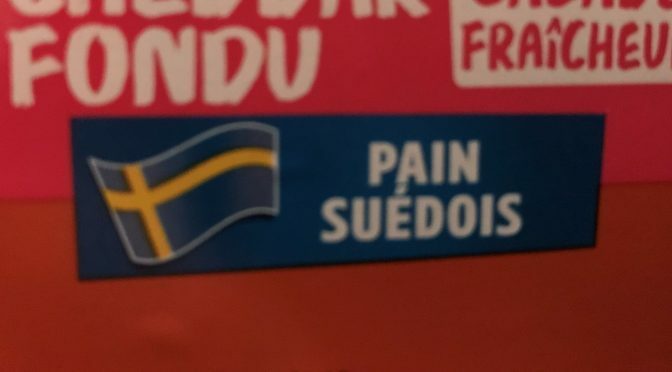 Second of all the French take on “Pain Suèdois” is far away from what they think it is. The meaning is to taste like “Hönökaka” or “Polar Bröd” I can say its not even close. And the Swedish “Hönökaka”, a very flat bread you actually need to eat no later than 1 hour from its taken out of the oven to taste good and not taste as you chewing on a dry piece of cardboard, is not a bread you like to sell onto the French public. “Polar bröd” is actually one of my favorite sort of bread so this I can understand if it tasted like “Polar Bröd”. A fresh bag of “Polar Bröd” in Sweden is a bread you gladly eat all of when you lucky enough to get it Fresh and if you really lucky a tad darker than its ment to be, a piece of heaven. But here in France only the look is similar to “Polar Bread”. So please my French friends don’t judge the Swedish bread as being as dull as the “ready to eat” sandwiches you find in the French stores. Sweden do not produce a lot of good bread but its far from as dull as the once marked “Pain Suèdois” in the Supermarkets. And they are fresh, buy and try. And if you are really lucky you might even stumble over a Bageri (Boulangerie) and as in France might find “real” bread and not mass produced as the once in the supermarkets go for a Bergis, Långfranska, småfrallor or a Fullkornsbröd. And if you are lucky enough to find a Bageri knowing how to do tunnbröd, voila… Thumbs up.